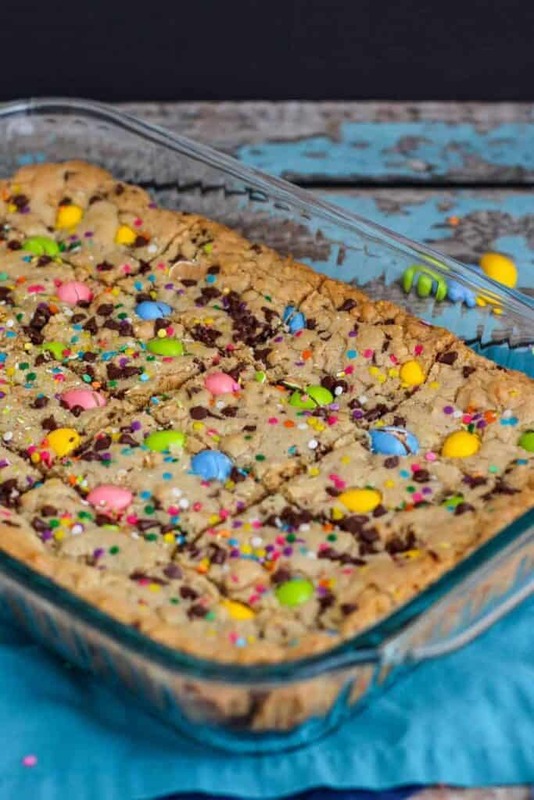 Celebrate the return of Spring with these colorful, sweet, and fun blondies! 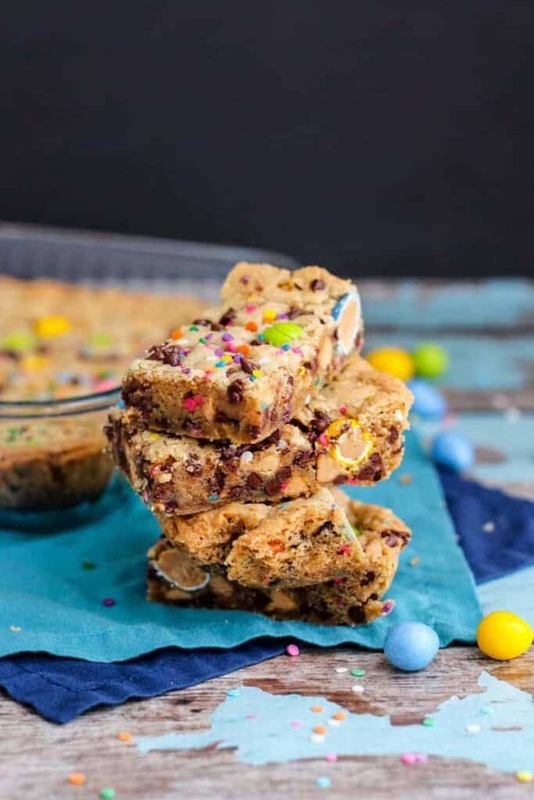 These chewy blondies are loaded with lots of good things: chocolate chips, peanut butter chips, sprinkles, and peanut butter-filled candy eggs. Admittedly, they’re a bit of a sugar bomb, but I think that they’re worth it. 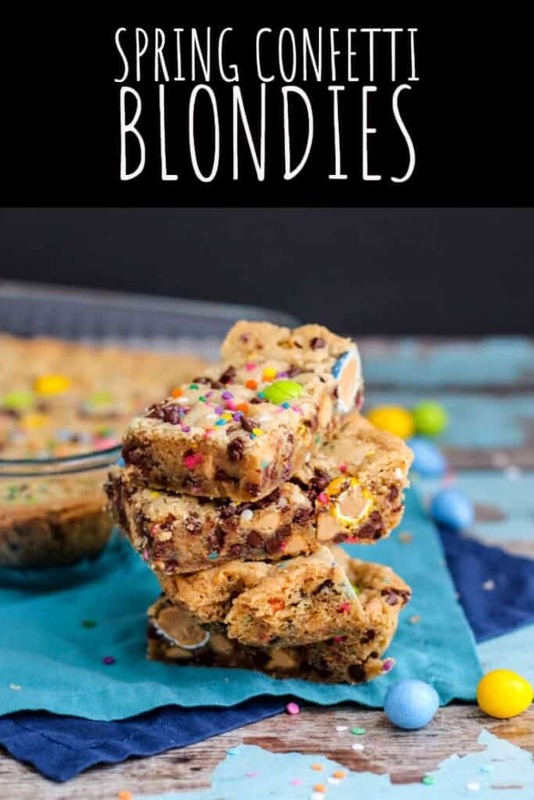 I made these these blondies in anticipation of the Easter holiday, but, not surprisingly, couldn’t get it together enough to post these last week. Since Easter has come and gone, you can feel free to substitute any candy you’d like in place of the egg-shaped Reese’s Pieces candy that I’ve used. Think M&Ms, regular Reese’s Pieces, and so on. 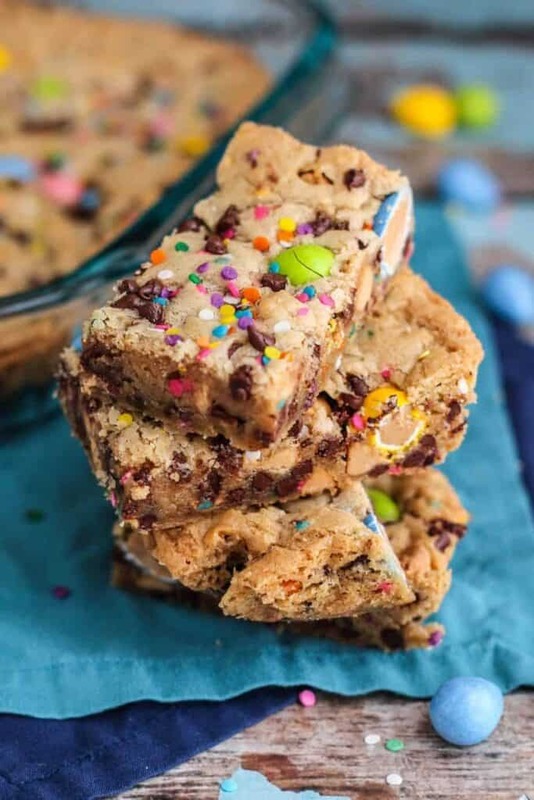 These sweet and chewy blondies serve as the perfect backdrop for whatever candy or mix-ins you choose to add. The base of this blondie recipe comes from The Cookies & Cups Cookbook. Preheat the oven to 350 degrees F. Line a 9x13-inch baking dish with aluminum foil. Spray the foil with cooking spray and set aside. Whisk the flour, baking powder, and salt together in a medium-sized bowl. Set aside. Cream the softened butter and brown sugar together in the bowl of a stand mixer until light and fluffy. Add the egg, egg yolk, and vanilla extract. Beat until combined. Add the flour mixture, a little at a time, until well combined. Scrape down the sides of the mixing bowl as needed. Add the mini chocolate chips, peanut butter chips, and sprinkles. Beat until all of the mix-ins are distributed throughout the dough. Press the dough into the prepared baking dish in an even layer. Top with extra mini chocolate chips and sprinkles. Lightly press the Reese's Pieces eggs into the dough, distributing them randomly over the surface. Bake for 20-25 minutes, or until a toothpick, when inserted into the center, comes out clean. 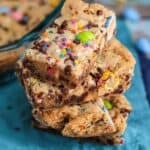 Allow the blondies to cool completely before cutting them into bars.